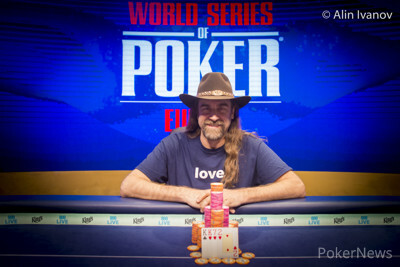 Shortly before 2 a.m. local time, Chris “Jesus” Ferguson took down WSOPE Event #7: €1,650 Pot-Limit Omaha Hi-Lo 8 or Better for €39,289. Coming into the final table fifth in chips, Ferguson looked comfortable laddering to secure valuable points in the 2017 WSOP Player of the Year race. The 54-year-old from Pacific Palisades, California was content to let opportunities to acquire chips pass him up. However, as the tournament drew on, and the prospect of a bracelet honed into view, Ferguson ratcheted up the aggression, eliminating the last four players to secure his sixth WSOP gold bracelet. 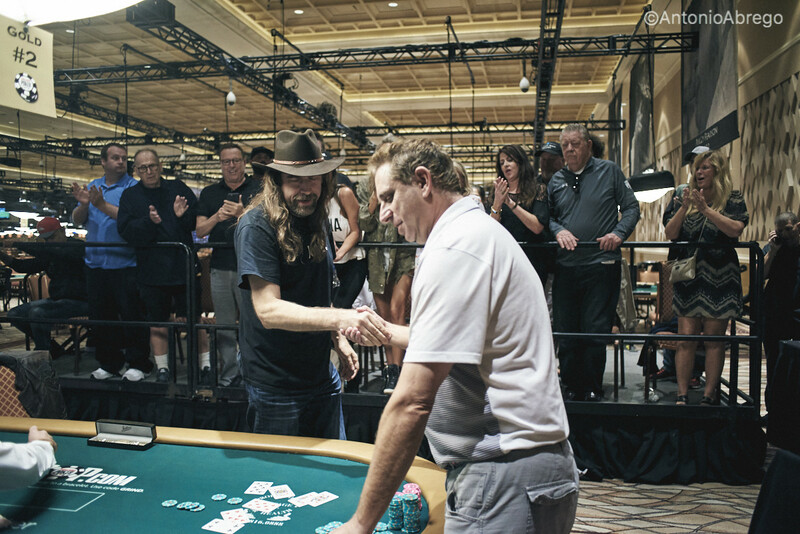 Speaking to our colleagues at WSOP.com, Ferguson said that the win felt “surreal,” as he wasn’t expecting to win this bracelet. In his first major interview since his return, WSOP.com asked Ferguson what he had been doing while away from the WSOP felt. “I just cleared my mind,” said Ferguson. “For five years I hadn’t really thought about poker. I didn’t really miss it. The main difference between 2010 and 2017? The quality of the players. “They’re getting better and better,” said Ferguson, “But I’ve always enjoyed playing against good players and I’ve always done really well against the best players! Earlier this summer in Las Vegas, Ferguson finished second to Mike Wattel in Event #72: $10,000 Seven Card Stud Championship (pictured below), and Ferguson said that he felt a lot of vindication closing out one at the very next opportunity. The field of 18 resumed at 2 p.m. local time, with Dario Alioto holding a commanding chip lead. However, his lead was cut early and it was Stanislav Wright who took over the lead. By the time Phil Hellmuth was eliminated to bring play down to two tables, there were just two further eliminations away from the money bubble. 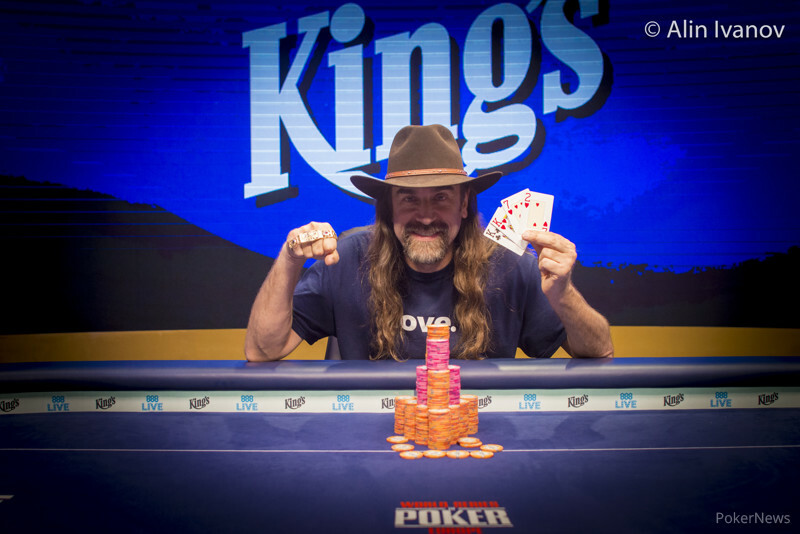 After the elimination of Ismael Bojang, Mike Leah ran his Queens into the Aces of overnight chip leader Alioto to bring the remaining 14 players into the money. Igor Sharaskin, Tobias Hausen and Fabio Esposito all hit the rail, before Christopher Back and Ferguson’s nearest POY contender John Racener were eliminated in quick succession by Rex Clinkscales and the players were redrawn around one table. Clinkscales’s chip lead at the unofficial final table of nine didn’t last long after he was involved in a monster pot against Artur Sojka. On a turn, over 900,000 in chips found there way into the middle with both players holding full houses. Sojka’s was best and it held to see him soar into the chip lead. Siarhei Chudapal hit the rail in ninth place, and after a brief consultation with WSOP Tournament Director Jack Effel, the eight remaining players went on a two-hour break before resuming for a streamed final table. 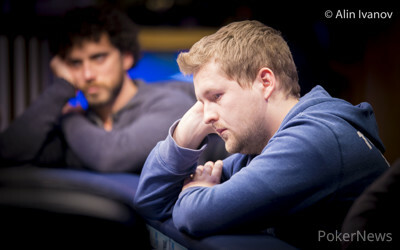 When play resumed, Sojka held over one million chips with Wright, his nearest competitor, only just over 500,000. Former German ‘Who Wants To Be A Millionaire’ winner Sebastian Langrock hit the rail in eighth, with Sojka extending his lead. 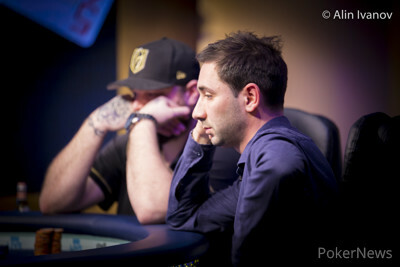 Sojka then three-quartered Stanislav Wright and was approaching 1.5m in chips. Despite being pegged back after Clinkscales doubled through him, Sojka eliminated start-of-day chip leader Dario Alioto in seventh to keep his lead intact. However, Sojka was once again pegged back after Divanshu Khurana and Ferguson doubled through him. 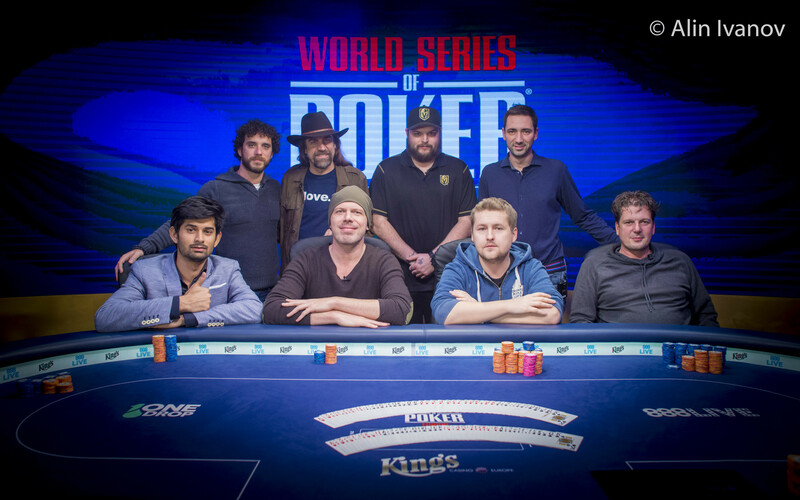 Khurana was eliminated in sixth place by Wright and Sojka’s lead was cut even further. Two hands was all it took for Rex Clinkscales’s final table to come to an end. First Ferguson doubled through him after flopping two pair and rivering a better low. Then, Ferguson cracked the Aces of Clinkscales after turning a full house to eliminate Clinkscales in fifth. Four-handed play was the deepest the tournament had been, with the chip lead changing hands and no one player managing to hold court over the other three for any extended period of time. 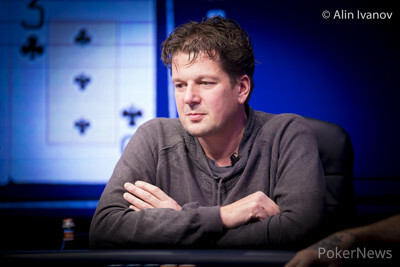 In fact, Eldert Soer, who was one of the shorter stacks at the final table, hit a run of form to go from last to first four-handed. Sojka, who had looked untouchable at the beginning of the final table, was on the receiving end of some of Soer’s chipping up and he was eliminated in fourth place by Ferguson. However, in this topsy-turvy final table Soer was sent to the rail after Ferguson rivered a wheel in a huge pot between the pair to hand Ferguson an almost 5-1 chip lead heads-up. Ferguson three-quartered Wright and then finished things off at the second available opportunity to join T. J. Cloutier, Layne Flack, Ted Forrest, Jay Heimowitz, Jeff Lisandro and Daniel Negreanu in winning six WSOP bracelets. Chris Ferguson raised to 90,000 on the button. Stanislav Wright called in the big blind. The flop came and Wright moved all in for 185,000. Ferguson called. Wright had the low draw and Ferguson's Kings were good enough for high at the moment. The turn was the which meant Wright would need to get a low card to stay alive. The river was the and Ferguson clasped his hands together and shook his opponent's hand. Wright takes home €24,283 for his second-place finish. Stanislav Wright raised to 90,000 and Chris Ferguson re-raised to 270,000. Wright moved all in and Ferguson called. The flop came giving Wright a pair of Queens. The turn was the giving both players the same low. The river was the giving Ferguson a flush and taking three quarters of the pot. Chris Ferguson raised in the small blind and Eldert Soer defended his big blind. Ferguson bet 120,000 on the and Soer bet pot to 540,000. Ferguson moved all in and Soer called. Chris Ferguson raised to 90,000 from the small blind. Artur Sojka defended in the big blind. The flop came . Ferguson bet and Sojka was all in for 155,000. The turn was the and the river the and Sojka was eliminated in 4th place. After coming in as the overwhelming chip lead to the final table his fortunes quickly turn, and he takes home €11,693 for his efforts. The remaining four players are going on a 15-minute break.